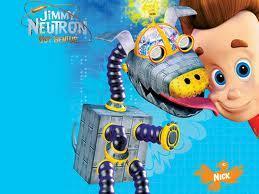 jim. . Wallpaper and background images in the Jimmy Neutron club tagged: neutron jimmy neutron jimmy nickelodeon goddard robot banner wallpaper. This Jimmy Neutron photo might contain аниме, комиксы, манга, анимационные фильмы, комикс, мультфильм, and книга комиксов. What are Ты doing in there Sheen? Jimmy Don't Want To Hear Sheen's "Reach out and Touch out" program.